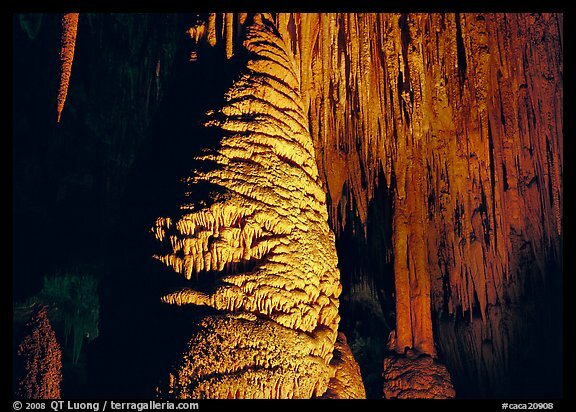 In Carlsbad Caverns National Park, the same 250-million year old limestone reef that forms the Guadalupe Mountains has been dissolved into caves. The gypsum that forms the rare sand dunes – last week’s photo spot – is one of the by-products of the dissolution of limestone by sulfuric acid. 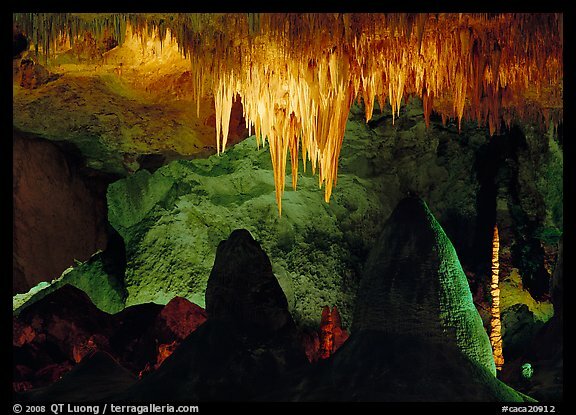 Most of the caves are formed from top to bottom by weak carbonic acid entering from above. At Carlsbad, sulfuric acid is generated where the hydrogen sulfide from the deep petroleum reservoirs meets the water table, forming the cave from the bottom up. The strength of the sulfuric acid leads to unusually large chambers in Carlsbad Caverns, such as the aptly named 8.2-acre Big Room (4000 feet long, 625 feet wide, 350 high), the third largest cave chamber in the Americas. 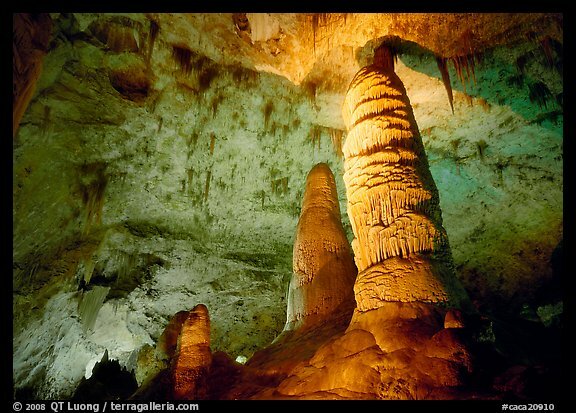 If I was to visit only one cave in the National Parks, it would clearly be Carlsbad Caverns. Not only are the underground chambers some of the largest anywhere, they are also filled with decorations of great beauty. While some of the most decorated sections (such as the Kings Palace, Queen Chamber and Papoose Room) can be visited only on guided tours that leave little time for photography, the Big Room can be explored at your own pace on a mile-long self-guided tour. The Big Room is graced with numerous formations, including the Bottomless Pit, Giant Dome, Rock of Ages, and Painted Grotto, that provide a variety of compositions. Unlike other caves where tripods are strictly prohibited, there is no limitation on their use there. Working in large format, my exposure times often ranged in the fifteen minutes. On my first visit, the film popped and shifted during the long exposures, resulting in unusable double images. On my second visit, I combated the problem by sticking double-sided tape to my film holders. The cave is open all year, and the underground temperature constant. However, if you want to observe the daily mass exodus of Mexican free-tail bats (400,000 +) that leave the caves to feed at night, you have to come from Memorial Day weekend through mid-October, as in late October the bats migrate to Mexico for the winter. The best bat flights normally occur in July and August. At this time baby bats, born in early summer, join the flight along with migrating bats from colonies further north. Note, however, that photography requires a special use permit that must be obtained from the park at least two weeks in advance. This is because white light disturbs the bats, and the average tourist cannot be trusted to prevent his point and shoot camera to fire its flash when it gets dark.